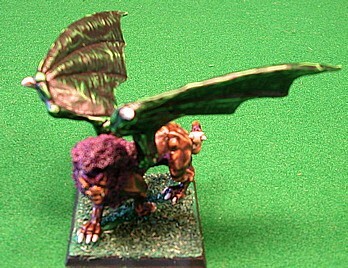 This manticore was originally suppose to be part of my Ork and Goblin army. This was back when you could have an unmounted monster in a Warhammer Fantasy Battle army. Then only certain monsters could be in certain armies so I painted it up with plans to use it as part of a Nurgle Demonic Chaos army in a campaign. I don't know if it ever took the field. Now in the third or fourth edition of the rules since I bought this model I think it can only be fielded if mounted by a Dark Elf. It will be a long time before I paint up a Dark Elf army to go with this model. It probably will never happen leaving this model orphaned and army-less. How I painted the wings was a big influence on how I painted the wings on Slim as well as how I do green in general now. Though I likely developed this green painting Gorka Morka orks like this one.